As many of you know by now, I was one of the few who braved the elements on Wednesday night to sit in the press box at the Coliseum. The effort wasn't great, but we'll get to that later. While getting reactions from certain players in the locker room after, I was thinking of what I would try and write about during the all-star break. The item at the top of my list was Matt Moulson. When people talk about leaders on the team, I'm not sure too many think about Moulson. I'll admit I was never one to consider him when it came to that. In general, the media always gravitates towards Matt. I would normally take the time to speak with other players for more of a unique angle. But for this game, I went with the crowd over to Moulson's stall. When asked about the effort, Moulson looked up from the ground, his long hair dripping from under his backwards hat: "It sucked." Later on, he was asked about his future on Long Island, where he reiterated his stance on wanting to be an Islander beyond this year. 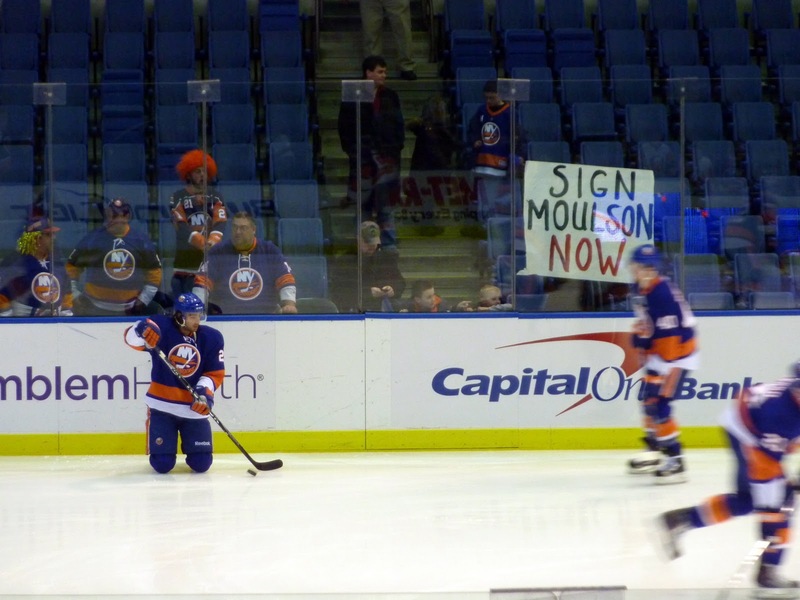 Once we moved over to speak with Rick DiPietro, Moulson stayed seated at his stall, head in hands at times and glancing into space during others. I've seen every player take these losses personally. It comes as no surprise to me that Moulson was like that, but as I said this was the first time I took notice of him after a game. I wondered what he was thinking about. You could tell things were going on in his head about the loss, his future and the team. Now, Moulson and the fans have to wonder no more. Moulson got his new deal to remain with the Islanders as he and the team agreed to a three-year, $9.4 million extension. I always maintained my stance during the show and in this space that Moulson and the Isles would agree to a two- or three-year pact. But as losses mounted and rumors got louder, I could see the writing on the wall: changes were going to be made (some already had been). Moulson could see that writing too. If no extension was agreed to soon, then he would be shopped an moved in February. The Islanders got very good value for a guy who is well on his way to what will be his 2nd consecutive 30 goal season. Over the three years, Moulson's cap hit will be at $3.13 million. He and John Tavares have had some good chemistry throughout their time together, and the Isles can't afford to break that up. They are also best friends, and Moulson even told Katie Strang of Newsday that Tavares "wouldn't have to shed a tear now." As me and many fans have said, depending on how they played out the Moulson negotiations could go a long way in proving that the team is willing to shell out some money to keep some of their own and give hope that maybe they can reel in a good player or two during the summer. We'll see what happens now, as history has a funny way of repeating itself, but this is certainly encouraging. One more point: Moulson is represented by Don Meehan, the agent for Evgeni Nabokov. I had some folks ask questions on whether that situation would screw up negotiations with Moulson. I didn't think so at any point in time. We can clearly see from this deal that was not the case. The agent's job is to work for the player. If Meehan was going to let that affect future dealings with the Isles, then he would have lost credibility as an agent since each player is supposed to be dealt with on an individual basis. Meehan obviously had conversations with Nabokov before he went public with the claim that his client would report to any team that claimed him in order to get his deal for next year. It's not his fault that Nabokov lied to him. So this was never going to be an issue in dealing with Moulson, Josh Bailey or any other Meehan clients. Isles/Canes Thoughts: On a night like Wednesday, one can't help but wonder if the weather dictated the play of the team. ﻿The Islanders came out really flat to start the game as the Hurricanes dominated the first couple of minutes. I made the comment on Twitter that they could not allow the Canes that much time. As up and down as they have been this season, they are very skilled. Those skilled players stole the show and helped in part to defeat the Isles. The other part was that the effort was not there again. Perhaps that was due to many factors such as the weather which affected the crowd (4,900 and change) but that can't be an excuse. Less people showed up in December after Christmas to see them knock off a pretty good Montreal team. In the post game, the interview that I found the most compelling was coach Jack Capuano. He mentioned that he felt some players were being "selfish." Those of us who were in the room looked around at each other. The first guy who popped into my head was Rob Schremp. After going on a good stretch, he hasn't been playing as well and I notice him doing some things that would define selfish. Lately, he has been pulling the "Jason Blake special." He'll get the puck on his stick, enter the zone, and then circle back to the blue line. Both defencemen will have their sticks raised waiting for a pass that never comes as Schremp will throw it towards the net himself. Coincidentally, this has been going on since Schremp has gone on his cold streak, one that also cost him a game as a healthy scratch. Quite simply it could be a case of a young player trying to do too much amid loses and a personal cold streak which can easily be translated into selfish play. Aside from Schremp I'm having a hard time figuring out who else could be included under that umbrella. The coach said that when the team returns from the break, they will get right down to business. He hinted that if some recent trends don't go away, then changes will be made. Everything would be fair game - replacing with players inside the organization, outside the organization or line changes. He went as far as to mention he would have to sit down with Charles Wang and Garth Snow to determine changes if it go that far. Clearly, the coach is unimpressed with certain players. Who do you guys think he was targeting with these comments? For those wondering what Kevin Poulin may have thought about the Evgeni Nabokov claim, the 20 year old let his play do the talking Tuesday night against the Penguins. Poulin looked sharp all game, particularly early on. That was a big plus considering he has had slow starts every time he has been in a game as a starter. A lot of debate has been going on about Poulin the last couple of days, with many wanting him to go back to the AHL to get the playing and development time he needs. That was the number one motive behind the Nabokov claim. With Nabokov refusing to report and Nathan Lawson out a week or two with a knee injury, Poulin will get some extra chances to prove that his time is now. Tuesday he certainly made a statement as he had what I would have to day was his most solid effort. The rest of the Islanders weren't to shabby either, but unfortunately their effort wasn't enough to topple the Sidney Crosby/Evgeni Malkin-less Pens. It took all of 49 minutes for the Penguins to finally solve Poulin as Craig Adams would put a rebound past Poulin. For the Isles, it was their 10th straight loss to the Penguins on the road. Unfortunately, we had yet another game with some pretty poor officiating on both sides of the puck. Some could say that they were letting the boys play, and it certainly appeared like it at times. However, the few calls that were made were very questionable. Fortunately, it didn't seem to cost anyone. In all honesty, aside from Poulin there was no one in particular who really stood out to me. Michael Grabner played pretty well and made some nice plays there, but it's the stuff he's been doing for the last month or so. It's great to see him keep that up and get the puck towards the net any way that he can. The defense looks shaky at times. I'm a big fan of Travis Hamonic, but lately he has looked a bit weak to me. He had a nice fight 26 seconds into the game with Tyler Kennedy. But defensively, you can tell that he is very young. He'll get there though. Overall, the team has a hard time shooting off of a pass. 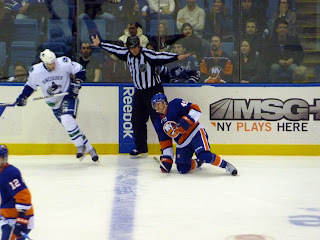 I notice quite frequently that the Islanders will pass the puck around at the point, and they will hesitate to shoot. Despite the fact that it wasn't very accurate, this is one thing I miss that James Wisniewski provided. He had his fare share of hesitations, but sometimes was not afraid to just rip a hard slap shot. A lot of the guys are hesitant to do that, and often have weak attempts or just have the shots easily blocked as they allow the defense to get set for the shot. The urgency is something that they need to continue to work on. 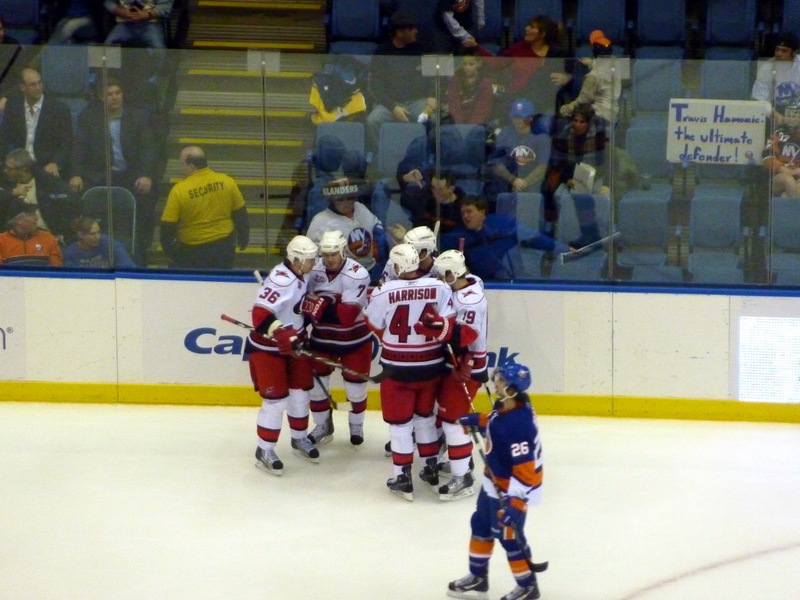 The Islanders return home for a Wednesday night match-up with the Carolina Hurricanes. The Canes have been playing some decent hockey of late, and have been one of those up and down bubble teams looking for a playoff birth. They are 9th right now, just one point behind the Atlanta Thrashers. I'm looking forward to seeing them live as I will be in the press box for the game (weather permitting). NABOKOV SUSPENDED: As expected, the Islanders suspended Nabokov after failing to report on the 2nd flight that the team set-up for him this weekend. It appears that he will not have a change of heart. So, as I mentioned earlier, Poulin has the chance for the time being to prove that he is capable of playing in the NHL. In the end, the Isles made the right move here with Nabokov. I was on the fence about whether or not it was worth it, but the guy left his team in the KHL and expected to fly through waivers unclaimed. The Isles need a goalie. I will be a little annoyed if the next few weeks come and go and the Isles don't attempt to add another goalie, because essentially what this whole fiasco tells us is that they are admitting that they jumped the gun on dealing Dwayne Roloson and that they still need another solid option for the remainder of this year and possibly next season. Either way, it remains to be seen how long this saga will go on. With sources claiming the Isles are likely to "toll" the contract into next season, the Isles have all the leverage here. The All-Star break will begin after tonight's game, but it appears as though there will be no more calls from Garth Snow based on his comments from last night. Any change of heart will have to come from Nabokov and his agent. The moral of this story? Don't think you can't find greener pastures in the KHL, have a poor showing, and expect to be able to easily just join a contender because it's convenient for you, and don't say you will report wherever you are claimed because you want "visibility for next season" and then refuse to report to the team that claimed you. While the league and the NHLPA are looking at the situation, something tells me the NHL is in support of the Isles because this sends a message to those who are willing to turn down decent offers from contenders in order to sign contracts in the KHL and expect to re-appear. Isles Get the Better Nabokov...But For How Long? In a somewhat surprising move (to me at least) the Islanders claimed goalie Evgeni Nabokov off waivers from the Detroit Red Wings on Saturday. The news broke at just a few minutes past noon, as usually happens with waiver claims. Who would have predicted all of the insanity that would ensue then. Shortly after the Isles put in their claim, I mentioned on Twitter that I was skeptical of whether Nabokov would report to the team or not. As I wrote in the previous post, Nabokov's agent Don Meehan said that Nabokov would report to whatever team claimed him "for visibility for next season." Clearly, he has no intentions to retire soon. But, he may leave himself no choice. A statement from Meehan says that Nabokov will not be reporting to the Islanders. Meanwhile, Nabokov has not yet returned a call placed by Garth Snow. The only thing we know is that Nabokov texted ESPN's Pierre LeBrun, saying he had no comment on the situation at this time. Clearly, Nabokov is thinking it all over. Right now, he has to make an important decision. He can either accept the claim and go to the Islanders for the final 36 games of this season, prove he still has what it takes to play in the NHL and pick-up a contract for next season, or decline to report, get suspended and effectively end his career. As if that wasn't bad enough for Nabokov, the Islanders are given the right by the league to "toll" the contract. What that means is that the Islanders could really screw with Nabokov - more so than he has already himself - and make his contract effective next season too. He would still have one year of service owed to the Islanders (credit for this nugget goes to TSN's Bob McKenize, who has done a fantastic job of trying to make sense of this all for us). Regardless of that, Nabokov won't get a job next season without playing in the NHL this year. His poor play in the KHL, one of the main motivating factors in the mutual contract termination has left a lot of execs wondering how much he has left in the tank. If Nabokov were smart, he would accept the assignment. He really has nothing to lose by reporting to the Isles. He gets to prove what he really can do over the span of the next 36 games with many chances to start and can play calm and relaxed given the Isles current standing. If he plays well, people take notice and the Isles climb closer to .500, and he is given credit and can then go for the gold next season if he so chooses. In the end, when all is said and done I think cooler heads prevail here and Nabokov does end up reporting. We won't know for sure when he makes this decision, or how long he has to make it. But Snow told us today that he has a plane booked for Nabokov for Sunday and the Isles appear to be going forth with their plans for him, stitching his jersey and adding him to the official NHL roster. NYI FYI LIVE SUNDAY MORNING AT 11 AM: Sean and I will go more into detail about all things Nabokov during our show on Sunday morning at 11 AM. You can watch us live by going to the UStream link. We'll be taking questions by AIM, the chat room and through Twitter if you prefer that route. I asked a question to see if some of you would welcome Nabokov if he changed his mind and reported, and it seems that a lot of you say yes. We'll try and read some of the answers and explanations on the air Sunday. Feel free to look us up on Twitter and give us your thoughts on the matter. 3:58: Nabokov's agent, Don Meehan confirms that Nabokov is refusing to report to the Isles at this time. Snow remains hopeful, saying that he is waiting to speak with the player. He also says they have a flight booked for him out of Oakland for Sunday. If he truly declines to report, the options are to either put him on waivers again or to suspend him. 12:10 PM: The Islanders have claimed goalie Evgeni Nabokov off waivers from Detroit. Now we wait to see if the reports. More to come. The Isles 5-2 win over the Sabres had a little bit of everything in it, including another strong relief appearance from a back-up goalie. Nathan Lawson got injured near the end of the first period which was a shame because he was looking pretty strong. He seemed to hurt his knee on one play, but played the remainder of the period despite looking very uncomfortable. He wasn't tested to hard for those last few minutes, and wouldn't return to the ice after the intermission. But more on this later. Kevin Poulin came in and was very good in relief. 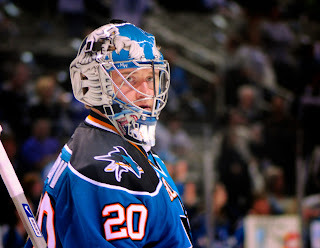 He looked shaky at the beginning but settled in and made some big saves, stopping 26 of 28 shots. In general, the Isles played well but in the 3rd when the Sabres kept pressing Poulin was able to stand tall and make some key saves. He only gave up two goals to Nathan Gerbe, both five seconds apart from one another. Michael Grabner had another solid game, scoring two goals. Prior to getting the empty-netter for his second, he tried to get goals for other teammates on the ice as he passed to Kyle Okposo and then later on the shift, Travis Hamonic. Both missed their opportunities, so when Grabner pressed and stole the puck for a 3rd time on the shift, he just scored it himself. Those were classy moves by him though. I'm liking more and more about him as a player and a person each day. Dylan Reese has been looking worse as time goes on here. Last year, he was solid. This year he's not getting many minutes, and each game lately seems to be falling or horribly out of position or doing something else that makes me notice him in a negative way. Losing Milan Jurcina for another 2-4 weeks hurts big time. The Islanders return home for the 2nd part of this home and home on Sunday, as they play the Sabres for the 3rd time this week. Rick DiPietro is expected to practice Saturday while we hopefully get more of an evaluation on Nathan Lawson. NABOKOV UPDATE: We'll switch gears again for now, leaving the goalie with zero NHL wins to discuss one with 293 - Evgeni Nabokov. At numerous points during the telecast, Howie Rose and Butch Goring talked about the Isles potentially putting in a claim for the goalie. Lawson's injury only intensified that. Of course, we don't know the extent of the injury. It was his knee, and we can't get any confirmation on if it was the same one that was giving him problems throughout training camp and at the beginning of the season. If Lawson is out for any extended period of time, then there is a good chance this happens. But will the Isles know in time? Claiming Nabokov regardless really can't be a bad move no matter how you slice it. The Isles get to add a name - some excitement, if you will - to a season that is rapidly approaching it's expiration date. It'll give the fans something to watch, and still send out that message that you are doing all you can to win until you are mathematically eliminated. DiPietro is still going through maintenance days and scheduled off days, while Lawson has looked pretty underwhelming. Meanwhile, as Chris Botta pointed out a couple of weeks ago, the plan for Poulin all along has been for him to go down to Bridgeport no matter how good he has been. Is that still the plan now? It should be. As good as he has looked he's not quite there yet. We're better off with him being a starter every night in the AHL. Nabokov, meanwhile, gets to play in the NHL and prove that he still has the goods to be a starter in the league. It was originally thought that he would refuse to report to certain teams, but his agent Don Meehan has since come out and refuted that, saying Nabokov "wants visibility for next season." It would not make any sense for a 35-year-old to sit out a season just because a lower seeded team claimed him on waivers. Then of course you have the price, which is essentially peanuts. It's right up the Isles alley and something that some people out there think will happen. It's very hard to find anyone around the NHL who actually thinks Nabokov will end up in Detroit after noon on Saturday, including members of the Red Wings organization. For those who have been confused by the waiver process in this unique case, Bob McKenzie of TSN has an excellent post detailing all of the various scenarios that can happen. It's a good read that provides a ton of clarifications on things that can and can't be done regarding trades, re-waiving and what it would take to end up with Detroit. Really odd stuff. I can say that after reading it, I agree with Blues President John Davidson 100% - this process needs to be looked at heavily during the upcoming CBA negotiations (the Blues fell victim to this rule twice this month when they tried to sign Marek Svatos and Kyle Wellwood out of the KHL but lost them on waivers to Nashville and San Jose, respectively). As of now, I stick by my prediction that the Isles will ultimately pass on Nabokov. If it were me though, I would claim him regardless of Lawson's injury for some of the reason's I posted above. I am hoping that the Isles do claim him, more so to do right by Poulin. We'll see noon Saturday. Be sure to check back for thoughts and analysis when and if something happens (or doesn't). The Islanders lost to the Washington Capitals 2-1 in what would end up becoming a very frustrating game. The effort was there and so were the chances. The Islanders had six opportunities on the man advantage and couldn't beat rookie goalie Braden Holtby once on any of them. Their only goal came from Michael Grabner after he used that speed to once again pick up a lose puck and create a breakaway for himself. Howie Rose was trying to think of the last Islander who had speed like he does. I can't think of anyone. He's by far the fastest I've seen (in my time of watching, anyway) and he has 12 goals already. I'm glad for him and for us that he's going to be our All-Star Weekend representative. It's a good story. Rick DiPietro was fine in net, stopping 22 of 24 shots. His reactions seemed quick. Both goals he gave up were from some much bigger Capitals using their bodies to get to the net and create chances or tip-in shots. The Isles defense is missing Milan Jurcina right now, and it showed in a couple of plays last night. Kyle Okposo making his debut looked much better than I expected him to. As I said a couple of days ago, it would be unfair to have any expectations for him at all this year. But aside from your usual rust, he had some nice chances getting to the slot and missed the net frequently. It was really nice though to have some slot presence there. Clearly, it hasn't happened much this season and you can see why this team is where they are now with Okposo missing 45 games. What a shame. The Islanders are on their way up to Buffalo to play the Sabres in a Friday night match-up. It is the first of a home and home as the Isles will come back for a Sunday afternoon tilt against them. One thing we know for sure right now is that DiPietro will not be making the trip. He was still feeling the effects of the flu after Thursday night's game and was hooked up to IV's immediately after changing in the locker room without speaking to reporters. So expect one of Kevin Poulin or Nathan Lawson to get the start. The Detroit Red Wings have signed goalie Evgeni Nabokov to a deal for the remainder of the season. The deal for the long time San Jose Shark is only worth $570K ($250K prorated). The interesting part of this story is waiting for Nabokov to clear waivers. Since he played in a European league this season, he has to clear. The Wings are trying to find a loophole in the CBA to avoid losing him. But it appears that many teams would be very interested in claiming him. Katie Strang reported the Islanders have had some internal discussions on if they should claim him or not. Many fans having seen Lawson play first hand now this season have been clamoring for an NHL goalie to come in either by trade or waiver claim and Nabokov clearly fits that bill. But would the Isles actually go through with it after speaking so highly of Lawson and Poulin? I'm not so sure. Claiming Nabokov seems to be a sign of admitting their mistake in dealing Dwayne Roloson as soon as they did and go against what they have been saying in the 20 days since. On the other hand, it proves that they are truly trying to do what it takes to be competitive, and it would fit their description of making a move that fits into both their short and long-term plans. They can easily play DP in half of the remaining games and split the time with Nabokov while giving Poulin the necessary time to develop in the AHL. Given his price, I think there is a slight chance the Isles would put in a claim for him but in the end I don't think it will happen. If the Islanders won more than just two of the five games on this recent home stand then I could see it being more of a possibility but right now I think it's doubtful. We'll see soon enough. Kyle Okposo has been around the team for virtually all season. Recently he started skating with the team on the ice and announced that he was still a little bit away. ﻿After a few days of skating with a "no contact" jersey on, Okposo practiced wearing a regular jersey for the first time on Wednesday. If that wasn't surprising enough - I wrote on our Twitter how shocked I was that he was doing so this quickly already - the Islanders announced after practice that Okposo will return to the line-up Thursday against Alex Ovechkin and the Washington Capitals. ﻿﻿﻿﻿It is indeed a pleasant one that many are happy about. I am a little uneasy about him not going down to Bridgeport for a few games to get some seasoning and his "game" legs back, but in all honesty is it really going to matter when you look at what this season has most likely become? No, not really. Besides, Okposo and the coaching staff said he wasn't going to play until he was 100% and I don't think Okposo would risk his well being just to get back on the ice sooner than he should be in a season like this one. At the very least, it gives people something to be excited about. Keep in mind though that slack needs to be cut here. There should be no expectations for him in an abbreviated season. Realistically he's still going to be in spring training mode. Keep that in mind when you think about trying to evaluate him on certain plays or in certain situations. This is a young player coming off a very major shoulder injury. No word yet on who will start against the Caps, but it seems the status of Rick DiPietro could be up in the air again. In my last post, I told everyone to step back from the ledge because of DiPietro getting his "maintenance day." Meanwhile, Wednesday he didn't practice because of sickness. Uh oh. Either way, Nathan Lawson went down and came back up and the Isles are carrying three goalies again just as Jack Capuano said he plans to do for a while. We'll see how this plays out tomorrow afternoon. As nice as it is to see Okposo returning, it would be equally as nice to see Frans Nielsen return from his seven game absence. It originally seemed like he was a good bet to return with the demotion of Jesse Joensuu, but Capuano said Nielsen's status was "uncertain" at this time. Finally, things are oddly quiet surrounding Milan Jurcina. He was hurt in Monday's game against the Devils and only played three minutes. He left with an upper body injury and that is all we know. It would be a shame to lose him again after he already missed 18 games this year with that hamstring injury. We've seen how well he has played here so this would be a huge blow. As has been the case with many game days this season, there was a lot of hoopla before and after Monday's matinee match-up between the Islanders and Devils. The day started off with an article from Katie Strang (subscription required) quoting Matt Moulson, with him stating that he wants to stay with the team that gave him his shot at the NHL. We learned that there have not been extensive talks yet but that the two sides were just beginning to meet. Later in the day, ESPN's John Buccigross left us a gem of a Tweet saying he has heard rumors that Moulson may be shipped off to the Bruins - and all hell broke loose in Islanders land. Since we didn't have a show yet this week to inevitably talk about this topic again, I want to reiterrate my stance on what will happen with Moulson: he will re-sign here for two or three years. I felt that way all along, and I still do after the whirlwind that was today. Bob McKenzie of TSN told us later in the day that Garth Snow had indicated to Moulson that he wants to sign him, but the negotiation stage has not yet begun. This is unsurprising to me considering that the team could only start negotiating with him after January 1. He also mentions that if he is indeed shipped out, it would not be to the Bruins. Moulson could certainly be a hot commodity if he does go on the market seeing as he plays one of the weakest postions in the NHL, left wing. Fantasy hockey aficionados know exactly what I am talking about here. It is very difficult to find natural left wingers who play the position well as many players have become accustomed to switching between both wings, with their primary positons being on the right side. So as one of those few, Moulson can make his case to get a decent payday should the Islanders not want to offer anything close. As far as what Snow would get in return to trade Moulson, well it wouldn't be a lot. Fans who are thinking that Boston would trade the Toronto 1st round pick need to really calm down. Would you do that for a player of Moulson's ilk? That's no disrespect to Matt, but I think many GM's are going to look at this situation and decide that a year and a half of good play at 27 isn't going to be enough for them to part with a fairly high 1st rounder in a league where players are entering younger and cheaper. Of course, I say this fully acknowledging that I have said numerous times in the past that Moulson can definitely play in this league and has done enough to prove to me that he is a consistent 25-30 goal scorer just based on the way he plays the game and where he gets his goals and chances from. Just not sure what other GM's are thinking. In the end I think all of this discussion will be moot and Moulson will remain an Islander like he and pretty much every fan wants. I would be shocked if I am wrong on this one, but I just don't see it. It is certainly a different situation than trading away James Wisniewski or Dwayne Roloson. Moulson is the most identifiable Islander player not named John Tavares. If Snow ultimately trades him, it will be of his own fault. I do not see Moulson getting crazy with his demands. He knows his place and more importantly knows where he wants to be. Before I jump to another topic, I would like to endorse the wise words of Chris Botta from earlier today. Those are indeed the folks you should be listening to when it comes to rumors and hearsay. I know there are others in the rumor business out there that people like to read, and that's fine. I choose not to deal with them, especially those who have been wrong more times in the past month or two than I can count on my hand - and that is specifically only on Islanders related rumors. But again, it's totally up to you. Meanwhile, the Islanders did indeed play that game against the Devils although I'm not quite sure if they realized it or not. I was one of those who were included in the working class today, while 13,000+ got to go to the Coliseum and watch live hockey. I'll keep this one short. I watched some of the re-play tonight and was completely underwhelmed. Two guys stand out to me: Michael Grabner and P.A. Parenteau. That's all I got for today as far as the positives. The other day in this space after the Isles lost to the Ottawa Senators I wrote that they had two games coming up: one that they could easily win (Buffalo) and one that they should win (New Jersey). The fact that they should have won this game and didn't is upsetting. Yes, the Devils are better as of late and yes they still have Martin Brodeur, who played well today. But that doesn't help to explain non-existent defensive coverage. No matter what the opponents record, if you're coming out with an effort like that in a professional league you are going to get smoked. Plan and simple. The reffing was another issue all to itself. Quite frankly, it was downright awful. There are games you watch where you are so frustrated enough with the effort that the last thing you needed was an equally bad effort from the refs but we had that here. They missed some calls and calling back the 3rd Isles goal was wrong, but in the end does it change the outcome of the game? Doubtful. The good news for now is that the Isles have a few days off before going at it again on Thursday vs. the Capitals. Finally, the game was overshadowed once again with the status of Rick DiPietro. I say 'overshadowed' because for some it was the story. For me it wasn't. This is to be expected. The moment Jack Capuano said the other day he was going to keep all three goalies up for "a little while" I knew that more of the same was going to be in store. I fully expected DiPietro not to suit up for this one. They are still going to be very cautious here. I'm not saying that it's right or anything, but it's what is going to happen. Perhaps I have just accepted it for what it is right now, but for some reason I am not as bothered by it. Maybe it's because we got to see first hand how bright of a future Kevin Poulin can have for us. Either way, this is the way of life for the Islanders and their fans as of right now. I do not think that there is anything to this at this time and he was truly getting another day off - just as they have been doing all year. Considering different stories seem to be flying fast and furiously around here lately, I'm sure there's going to be more things to address. Hopefully, some of it is better news. The Islanders effort on Saturday night was a ton better than on Thursday against the Senators. It showed not only on the ice for some of the simple plays but also on the scoreboard by night's end. John Tavares scored a natural hat trick in a span of 5:44 in the second period to help the Islanders defeat Ryan Miller and the Buffalo Sabres 5-3 on Saturday night. Obviously, the story of the night was Tavares and how he completely took control of the game and turned it around after the Isles were trailing 1-0. Finally he, Matt Moulson and P.A. Parenteau are playing with some good chemistry. That has been one constant for the past 15 games or so. The side story was Rick DiPietro, who made 40 saves in his return after an 11 day absence. To me, he looked slow at times in his lateral movement but that was to be expected after suffering that groin injury. It sounds like he was in a lot better shape than he was at practice a couple of days ago. Michael Grabner also had another strong game, making some nice defensive plays and using his speed to create some chances. He had a nice shot for the Isles 5th goal. He too is gaining more and more confidence coming on the heels of being named as the team's lone representative for All-Star Weekend. The Islanders seem to be engaging teams in track meets lately, and have generally fared well. I would be weary about this since they are giving up a ton of shots and the defense is getting out of position here and there, but it's what is working right now. There is some learning on the fly involved as the team brings along Travis Hamonic and guys like Andrew MacDonald continue to develop. One thing's for sure - with the way these games are going with high shots, it's a good test for DiPietro to see exactly how much he can handle. We now need to know seeing as he is the man in net right now. No NYI FYI Sunday: Due to illness, we did not get together to record this week's episode as we normally would. We're going to play it by ear to see if we can get something during the week but no promises. In the meantime, be sure to continue to check this space for any updates on that as well as thoughts on matters surrounding the team. The Islanders announced today that they have put Jon Sim on unconditional waivers, effectively ending the wingers tumultuous four-year career with the team. Sim explained to Katie Strang of Newsday that he is trying to get a spot with a team over in Europe. On Monday, Sim was waived for the fourth time this season. He had one goal and four points with the Isles this season, while putting up 7-2-9 in just eight games with the Bridgeport Sound Tigers. There are some fans who are unhappy with the way this has played out, with many expressing distaste for the fact that he didn't fulfill the contract he signed. In all honesty, I have never been a big supporter of Sim, not even when the Islanders originally signed him back in 2007. But I do not have any issues with what happened here. Sim had the right to reject an assignment to the AHL and the Islanders in turn had the right to go through with the process of terminating that contract if it came to this. This is all in the rules and legal. Sim really liked this organization, and for the better part of four years did what the Islanders told him to do. He never complained and just did his job - played hockey. Sure, Sim knew that signing the two-way contract that he did for this season meant that he could go up and down as much as the Isles pleased. But he seemed fine with that. It isn't common for players to refuse assignments to the AHL, but it does happen a couple of times a year. Besides, for all we know this arrangement is something Sim and Garth Snow could have talked about a while back. In the meantime, Sim will get to go do what really is best for the 33-year-old's family and career at this point in time. As far as sports are concerned, there isn't as much money in the NHL as there is in other sports - not even close. If I were a professional hockey player and was presented with the opportunity to make more money, I would take that deal. I think part of the reasons the fans are so upset with Sim is because in general, it has been the thing to do ever since he got that three-year, $3 million contract after the exodus of Ryan Smyth and company. Jon Sim isn't a very skilled hockey player, and unfortunately due to various other factors more often than not found himself playing on lines he really had no business being on. So in that sense, some of the vitriol is misguided. For many, Sim will always be a symbol of what some feel is wrong with the franchise. Having said that, I agree with the sentiments that Strang expressed that Sim was a great guy who had an awesome sense of humor. He was always upbeat and would give you some time to talk if you needed it. It's definitely a little bit of a loss of character for the organization to suffer. This now changes the roster equation a bit now when it comes to who the future call-ups will be when other forwards get hurt. We have already seen guys like Rhett Rakhshani and Jeremy Colliton come up. Perhaps now we will see David Ullstrom at some point. Best of luck in Europe, Jon. Wishart Soon? The Islanders also announced that defenseman Dylan Reese was put on waivers and will presumably clear and head down to Bridgeport. While it probably really isn't newsworthy as the Isles have been carrying seven defensemen around and need to get Frans Nielsen back on the roster soon (but not for tomorrow), I'm wondering if it's a precursor move to seeing newcomer Ty Wishart come up soon. It would make sense seeing as Wishart has laced up in four games for the Sound Tigers as of right now, so he could be down there just to get acclimated to the system for a handful of games. DiPietro Appears Ready: Rick DiPietro manned one of the nets by himself Friday at practice, leading many to believe that he will be well enough to get the start tomorrow night against the Buffalo Sabres. In fact, both he and Jack Capuano seemed very optimistic and the goalie said that he felt great after the practice. Who his back-up would be is another story, but the right move here would be to send Kevin Poulin down to get more starts and continue on a steady development plan. It's very difficult for someone to say a team played pretty poorly when they scored four goals, but on a night where the Islanders would give up six to the Ottawa Senators you definitely can - well, for the first two periods anyway. The Islanders came out very flat, as evidenced by Daniel Alfredsson's goal 32 seconds into the game. That would be the first of a few that the defensive pairing of Andrew MacDonald and Travis Hamonic would let get by them. It has been a bit of a concern lately to see the entire Isles defensive unit give easy chances to opposing players, letting them virtually waltz into scoring areas. It doesn't help that the team's leading shot blocker in Mark Eaton is out for the year, but with Radek Martinek, Milan Jurcina and MacDonald still around it shouldn't be too much of an issue. The Islanders essentially didn't show up in the 2nd period, allowing the Senators to score four goals while getting out-shot 17-7. The Islanders would get a goal from Blake Comeau just prior to the Sens going on their scoring run, but the excitement would only last for 20 seconds. The third period the Islanders seemed to finally find their game - and their game plan. By throwing whatever shots they could at the net, they discovered how vulnerable the shaky Robin Lehner, making his first NHL start, was. The 19-year-old looked overwhelmed at times, and it is disappointing that it took the Isles that long to figure that out. Lehner is a really great prospect though, and much like Kevin Poulin could use some more seasoning in the AHL. It comes as no surprise that the game was that high scoring. The power-play was an Achilles heel for the Islanders, however. Despite getting many chances on the man advantage, the Islanders could not get any momentum going. They were entering the zone really slowly, dumping along the boards and causally skating to the puck. It allowed the Senator penalty killers to get there quicker and easily clear the puck. Jack Capuano made what is becoming his usual quick hook of Poulin in the 1st after the second Ottawa goal in favor of Nathan Lawson. Lawson was in the net for the Sens next four goals, and after the 2nd period would be replaced again by Poulin. This move is odd, but there is a recent precedent - former Isles goalie Dwayne Roloson was pulled in his 2nd game with the Lightning against Pittsburgh for Dan Ellis and then later re-entered the game as the Bolts went on to lose 7-1. With a 20-year-old in Poulin, perhaps Capuano was just looking to settle him down a bit and wanted to give him another chance to boost his confidence a bit before his possible trip back down to the AHL. Rick DiPietro is a possibility to start the next game against the Sabres. All in all, it was a tale of two games for the Isles, with their better effort only coming in the final 20 minutes. That isn't enough to win anything, no matter what team you are. While this Isles team is depleted and young, efforts like this should not be happening this frequently. If you can put out good efforts against teams like Pittsburgh, Detroit and Vancouver, with similar line-ups to the ones iced tonight, why can't you do the same against a team that has been essentially a mirror image of yourselves this season? It really shows how long this team has to go in their progression. We've hit the point now where games are coming at us fast and furious. As I mentioned, the next game is Satruday night, followed by a Monday matinee against the Devils. The Isles need to find a way to put out some more consistent efforts, especially against an opponent they can beat and one that they should. One thing this team still has to work on is that power-play though. The movement is too slow, and the fact that they are dumping and chasing in a very nonchalant manner isn't going to do any good. We'll see what they work on in practice on Friday. One last note - Trevor Gillies scored his first NHL goal in the 1st period. Congrats to the 31-year-old fighter who has travelled to many cities playing professional hockey. At least he can now say he has one, no matter how ugly it was. For anyone who enjoys a very high energy, up-tempo game, then the Canucks visit to Long Island was something we hope you saw. Unfortunately for the Islanders, the best team in the NHL was a little to much for them to handle - but not by much. After 65 minutes of play, the game went into a shootout where the Canucks won 2-1, giving them the game at 4-3 overall. While there were only a total of six real goals scored in this one, the amount of chances each team had was unbelievable. The Canucks enjoyed a 51-41 shot advantage for the game. It's even more astounding when you think back to how many blocked shots each team had. Obviously, there were a number of defensive gaffes on both ends by pretty much everyone on both teams on the blueline. For every player I think of, I can think of a good and bad play they made. But it made for some good entertainment. Kevin Poulin made some nice saves, and let up a couple of big rebounds that Vancouver was unable to convert on. A couple of the goals, however were not his fault. The Canucks passed the puck multiple times from the corner towards the front of the net, and that resulted in two goals for them. Both times, the defensemen on the ice were unable to get the job done. It is worth nothing that both times, Milan Jurcina was one of those defensemen but aside from that he had a pretty good game and laid some big hits. The shootout did Poulin in unfortunately, as he was beaten by a spin-o-rama by Mason Raymond and a nice deke move from Ryan Kesler. He did make 48 saves, and play as well as he had to to get the job done but in the end the Canucks would walk away with the two points - which puts then 29 points ahead of the Isles, for those of you who are counting. Blake Comeau has continued his hot play, scoring a goal and registering an assist. Lately he has been scoring by using his slap shot which has been powerful and pretty accurate. I have been getting upset with him lately when he was on a rush and trying to pass the puck off to Jon Sim. It's good to see him taking the initiative now. John Tavares also kept up his hot streak, scoring a goal on a one-timer after a nice pass from Rob Schremp. He now has 15 goals for the year. The Islanders should be happy they at least picked up a point in this game. More importantly, they were able to run all game with a team that is very talented and very fast. The Canucks didn't play at the top of their game, but they did have more nice chances than the Isles did and either squandered them or ran into the hot Poulin. All in all, it was a good performance. The Islanders take on the struggling Senators on Thursday. The Sens are coming off of a 6-0 loss to the Boston Bruins. It was the sixth time this season they have lost by a shut-out. Needless to say, they will be coming into this one pretty annoyed. ﻿ Rakhshani Injured: Rhett Rakhshani was injured during this game as he suffered a concussion after a big hit. It didn't seem malicious or with an intent to injure, although many fans who didn't remember the hit wondered if it was given the fact the refs really let a lot slide in this one. We don't know the status of Rakhshani yet, but I'm sure we'll hear some updates in the coming days. Okposo Practices: Kyle Okposo practiced with the team on Wednesday, wearing an orange practice jersey along with Frans Nielsen. Okposo still seems like he's still a ways from returning to the line-up, but it's a great sign if he can start practicing with the team more often than not in the coming weeks. Speaking of injuries, Garth Snow expects Rick DiPietro to return either Thursday or Saturday. Those of us who were optimistic after the Isles overtime win on Saturday night, such as Sean and I, were very disappointed in the Isles performance on Sunday night in Chicago. The Islanders were completely dominated by the Blackhawks from the word "go" as they shut-out the Isles 5-0. The game cannot solely be pinned on any one player. Nathan Lawson was left out to dry by both the forwards and the defense. In all honesty, the effort was putrid and very unacceptable. These kinds of problems simply cannot happen if you are trying to show everyone you are turning the corner. Don't get me wrong - every team is entitled to the occasional bad game, but not as frequently as it has happened here. The Islanders really didn't get any great chances on Corey Crawford aside from Michael Grabner's breakaway and Josh Bailey's chance all alone in front of a briefly wide open net. The puck rolled right off of Grabner's stick when he cut in on Crawford, while Crawford made a huge and unbelievable pad save on Bailey. Both events were microcosms of the game, honestly. This was your classic case of talent shining through. Marian Hossa, Patrick Kane and Jonathan Toews were all factors in this one for the Blackhawks, who are now healthy and finally have all three stars back together again. Behind Crawford's hot goaltending, they are starting to click a bit as they battle in the tight Western conference. All in all, however, the Islanders road trip was overall successful. They finished 3-2-0, which is tough to do on these trips out West. In general the Islanders played well, and played well enough overall to win in Edmonton but couldn't get another puck past Devan Dubnyk. The Islanders don't have a heck of a lot of time to get their act together as they return home to face yet another excellent team on Tuesday night in the Vancouver Canucks. The Canucks have been on a tear, although their recent streak was ended by the Detroit Red Wings. This is still a very good team though that will be tough to beat. The Isles have fared well against them though the last few seasons, so perhaps it could be more of the same as far as that goes. NEW SHOW POSTED: As always, we had our show Sunday afternoon and have posted it at both the podcast and the UStream sites for your listening or viewing pleasure. We hope you guys enjoy! Isles 4, Avs 3 (OT); Tune in to NYI FYI on Sunday! As I had originally thought, the Islanders indeed decided to go with Kevin Poulin after his strong NHL debut in relief of Nathan Lawson on Thursday night. 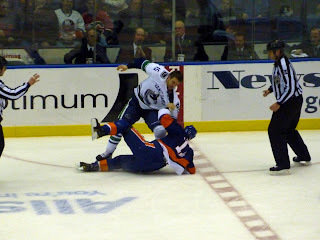 Unfortunately for Poulin, this one didn't start off as smoothly. In the end though, Poulin would end up with his 1st NHL win. Within the first three minutes, the Avs had a 2-0 lead on the Isles. But they seemed to regain composure, and Poulin started making some nice saves. Jeremy Colliton, playing with the Isles for the first time since leaving North America last season to go to Sweden, got the Isles first goal on the power-play putting in a rebound left by Craig Anderson. Later in the 1st, Colliton would score again, being left alone in front of the net, and scoring on one heck of a wrist shot. The former 2003 2nd round pick of the Isles looked good and for this game and finally showed glimpses of why he was so highly regarded a number of years back. Colliton is just 25 years old, and it was nice to see him contribute. The odds are against him, but perhaps his dream can still come true of contributing to an NHL line-up. Like I mentioned, Poulin made several key stops after settling down from the slow start, but the Avs really pressed in the 3rd. They finally broke through with only seconds remaining, setting the stage for John Tavares to make a nice cut towards the net for the game winner in overtime. Blake Comeau was also a standout to m in this game. His goal came off of that awesome shot that he is known to have from time to time - and I really wish he would use it more. Lately we are seeing the Comeau we were all hoping to see at the beginning of the year. There were a couple of plays he made that stand out because of how he hustled. He laid a hit on an Avs player after he was beaten to the puck, but Comeau really went full speed to the area and even though he just missed winning the puck in that battle, he slammed the player into the boards by the benches. It's things like that that make me smile and say that's how he's supposed to play. Now if only he could find a way to put in that kind of effort every night and not only when he wants to. As a side note in this game, of course, Rick DiPietro was sent back to New York on Friday night to "rest and get treatment" on that tweaked groin of his. For many this raises red flags. Unlike Sean, I have been very optimistic about anything DiPietro since his quick stint on the IR three weeks ago. Generally, this situation doesn't earn the benefit of the doubt but I am once again giving it to them. He wasn't going to play in either of these weekend games supposedly, so sure - send him back to prepare and not risk further injury. I don't think he's serious right now but could possibly be very close to being hurt bad once again, so better to let him take the entire weekend off and go from there. We'll see. hopefully we can ride with the "Poulin Wall" (thanks for the nickname, Chris Botta!) for a little bit to buy some time. NYI FYI Sunday at 11 AM: Sean and I will be on live at 11 AM for the next installment of the NYI FYI show. You can watch us do the show through UStream where we will have a chat room up and running, as well as AIM. We'll give you the SN when we're on. For those who can't watch the live show, you can watch the recording on that UStream site or as you have been able to in the past, just check out the podcast site. We hope you guys enjoy and for those of you joining us live, come prepared with your thoughts and questions! I originally thought that it was good news that the Islanders had two days off after facing so many shots on Monday night in Calgary. But perhaps it was one day too many. The Isles came out very slow in this game, and within the first four minutes found themselves in a two goal hole that they would not recover from. After giving up the goals, Nathan Lawson was pulled in favor of Kevin Poulin, who made his NHL debut. Similar to the way Lawson did it in Calgary, the 20 year old Poulin came in and looked very poised. He wasn't tested as much as Lawson was in Calgary, but Poulin did come up with some solid, nice saves - some that most goalies should get, but rookies can have problems with. So that's a good sign. Lawson wasn't particularly awful in his brief couple of minutes, either. The Oilers' first goal came off of an odd play as Andrew Cogliano's shot careened off the end boards and in front of the net, where Gilbert Brule was sitting virtually all by himself. Both Lawson and defenseman Andrew MacDonald realized where the puck was a tad too late. The second goal was a good move to the net by Dustin Penner. Milan Jurcina got caught off guard a bit and turned to catch up with Penner but he was already out of reach. It made for a rather easy play as he cut in towards Lawson. Penner has the ability to be an excellent power forward and when he gets his acceleration up to speed, it's tough to stop. Jurcina has to be a little more alert than that there, and Lawson has to make some kind of a confident attempt there, like a poke check. He seemed to be just waiting for Penner to get closer to him but before he had time to think, Penner put the puck by him. After that, the Islanders finally started to play well. This happened from the five minute mark of the period and on. I was hoping to see the Islanders keep the momentum going into the second, and they did. The Islanders had some excellent chances on Devan Dubnyk, but he made some good stops and stood tall. The Islanders failed to convert on any of the seven power-play chances that they were given after going a combined 4-for-4 in the last two games. The failed chances included a big 5-on-3 opportunity for 1:33 with less than five minutes remaining in the game. That is something that you absolutely have to cash in on if you plan to win a lot of games in this league. The failure to tie the game there gave Edmonton the 2-1 victory. Michael Grabner had a breakaway early in the game that he failed to convert on, and that's something that he usually is pretty good at. He knows he has to put that in. If he does there, then the whole complexion is changed as the Isles would have had the quick lead on a fragile Oilers team. Instead, the save was made and the Oilers capitalized quickly after that as they went on to end their seven game losing streak. The loss wasn't the only bad news the Isles got on Thursday, however. 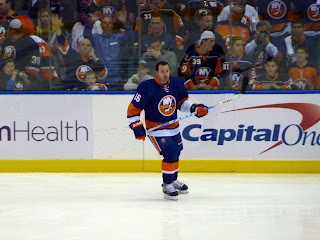 Prior to the game, the Islanders said that Frans Nielsen is day-to-day with a groin tweak and that Mark Eaton had flown back to Long Island where he is diagnosed with a labrum issue in his hip. It's been recommended that he get surgery, but he will seek a second opinion. He is out indefinitely for now, but obviously if he gets the surgery he will be out the year. That's the same thing that Mike Mottau had, and he's out for the year after surgery to repair a hip labrum. Nielsen was more of a game time decision than anything, so despite them taking it day by day, I figure he'll be back Saturday. Rick DiPietro practiced but didn't dress. He's also day-to-day. If DiPietro can't go against the Avs, then Poulin certainly made his case to get the start. We'll have to see what the decision is there within the next day, and who practices on Friday. The Islanders announced Wednesday evening that they have signed defenseman Milan Jurcina to a one-year contract extension. Jurcina, originally signed for just this season at $1 million, will get a $600K raise next season. Jurcina has proved to be an excellent signing for what he provides. When brought in, everyone said that as a bottom pairing, 18 minute guy he can be good and that has been the case. The feeling from many Isles fans is a good one. They realize the need for some size on the blue-line and apparently, the team does as well. Some feared that the addition of Ty Wishart to the organization meant that they were going to move Jurcina, but now we see that isn't the case. Naturally, as is the case with anything in sports there will always be some detractors. I had a spirited discussion on our Facebook page with a fan about the move. He brings up Jurcina's lack of speed, lack of an offensive game and the fact that he doesn't use his big body. All are fair points, and everyone is entitled to their opinion. Just prior to getting injured, I featured Jurcina in this space. Jurcina missed a lot of time, but is still tied for the team lead in hits among defensemen (58). Jurcina has used that big body to his advantage this season, and at 27 appears to have finally hit his stride and found his niche. Jurcina is a mainstay on the PK, which is essentially what he has been his entire career. It has always been said that he has a big shot he rarely uses, and anyone who has watched the games this season will agree with that. We have seen glimpses of the shot, and we can count on one hand how many times it has been accurate. But that isn't why he was brought in. The Islanders wanted a big, youngish defenseman and that is why Jurcina is here. The salary he will get is on par with other solid defensemen who throw hits and play a lot on the PK. The Islanders now have six defensemen under contract for next season. Radek Martinek is in his final season before UFA, while Jack Hillen and Bruno Gervais are going to be RFA's. The latter to have been underwhelming this season, more so for Gervais. After showing glimpses two seasons ago that he can be a solid defenseman, he has really fallen off. It's very hard to find anyone out there who thinks he will be back. He will most likely be here all year however, seeing as he has no trade value. Hillen is a guy I'm on the fence on when it comes to thinking about if he will return or not. I originally thought he would not, but now it seems unclear. He's still 24 and might have some untapped potential, but it is most likely not much more than what we see now. For a small, offensive guy he does block a lot of shots. That may be something the Isles will value, and the offense from the back end is something that is a glaring need. We don't know what we have yet in Wishart, but I think it's a safe bet to assume the Isles would qualify him after the season for a longer look. They did trade the only stable goalie they had for him at this point in time, after all. It's possible we might see the Isles try and ship someone under contract out, like Mark Eaton. His name has come up here and there in rumors. Who knows. In the meantime, I'm happy with this deal for only the one year. They always say "if it ain't broke, don't fix it," and Jurcina has been the least of the Isles problems, and they played better with him than without him. We both were in the same camp as the majority of the fans asking to re-sign him, as we mentioned on the show this past week. All in all, a good deal and I'm happy the Isles realize the need to retain the size they have on the blue-line. 11:15: The Isles have called up Kevin Poulin from Bridgeport in case DiPietro can't go by Thursday. The injury doesn't seem to be serious. 8 AM: The Islanders 5-2 win over the Calgary Flames on Monday night was overshadowed by the fact that Rick DiPietro left the game early after making a save and then having a hard time getting up. The injury was obviously a lower body one, with many people speculating about the knees and hips again. Word came out in the 3rd period that DiPietro was suffering from a strained adductor - essentially, his groin. I remain hopeful that this was just a precautionary measure taken in a game that the Islanders were truly dominating at the time. Of course, this gives more credence to the thought that the Islanders traded Dwayne Roloson away too soon. If anything serious is wrong with DiPietro, then as of now the Islanders would have Nate Lawson as their starter and either Mikko Koskinen or Kevin Poulin as his back-up, both with no NHL experience at this time. The Flyers have Michael Leighton on waivers and many fans want the Isles to scoop him up. Sean posted on our Twitter last night that he thought they should. I, on the other hand, don't think it will happen. We don't know how serious the injury is, and probably won't before the time to claim him comes to a close. Also, while Leighton is inexpensive, it remains to be seen how inexpensive a player has to be in order for the Isles to add them. Meanwhile, the Islanders had an overall good effort against a Flames team that has been just as hot as they have been. They came out like gang busters in the first and jumped out to a quick 2-0 lead thanks to John Tavares and Matt Moulson. Moulson's goal was a thing of beauty, set up nicely by Tavares and P.A. Parenteau. Tavares played with the most confidence that I have seen in quite some time. All of a sudden, he seemed to have a spring in his step and an extra gear that was kicking in. His speed still isn't the greatest, but it was encouraging to see that perhaps we have something to work on that's better than we thought. Who knows - perhaps the articles stating Tavares wanting to leave, which he quickly denied, added some punch here. Moulson and Parenteau had awesome games too. I've been critical of Parenteau but this game was the most complete game I saw from him as an NHL player. Lawson should be applauded for his effort in this one as well. It is very difficult to come in and relieve for any goalie, let alone a 27 year old rookie with one game of NHL experience to his name. But he went in and was tested early and often, only giving up one goal and making several key stops. Rebound control is certainly something that will need to be worked on, but luckily it didn't kill Lawson against the Flames. I am really liking the Grabner-Nielsen-Bailey line more and more each game. They control the puck very well, and had some nice shifts where they controlled the puck for virtually the entire time on the ice. It's really nice to see all three playing well and with some good chemistry. Jack Capuano seems to have found a good thing there. The Isles have now won seven of their last nine and have a couple of off days to figure out DP's status. They play Thursday in Edmonton against the Oilers. Naturally we'll have updates for you here. For those of you who are unaware, we did record and post our latest show on Sunday. We have the podcast available at the MyPodcast site. We went live for the show through UStream, and also have the first ever recorded show available here. Hopefully you all like the format as much as we enjoyed making it. We're still trying to learn all the bells and whistles, but it was really fun and we look forward to using it as we continue to make improvements to the show. The Islanders made the first trade of 2011 by sending goalie Dwayne Roloson to the Tampa Bay Lightning in exchange for defenseman prospect Ty Wishart. We'll look at this deal first from a talent perspective. In the end, the Islanders got good value for the 41 year old Roloson who is at this point a rental for the Lightning. Wishart is a 22 year old defenseman who still has some growing to do but was having a promising season so far for the Norfolk Admirals of the AHL. The 6'4", 215 lb Wishart is about to enter that age where big defensemen with some offensive talent begin to show their true stuff. Wishart had a good first pro season before trying to do too much offensively and letting his defensive game suffer. This season he seemed to be getting back to the things that made him the 16th overall pick in 2006 by the San Jose Sharks. Wishart is a guy I have been hot and cold on the last few seasons, but generally have liked. He's one of those guys who seemed to be in trade talks for the past few seasons, and one of those guys you wouldn't mind picking up. He was in Tampa Bay as part of the trade that sent Dan Boyle to San Jose. Many felt at the time that the best player going to Tampa in that deal was Matt Carle, but many analysts felt that Wishart had the potential to be the better defenseman because of how young he was and the style of game he plays. 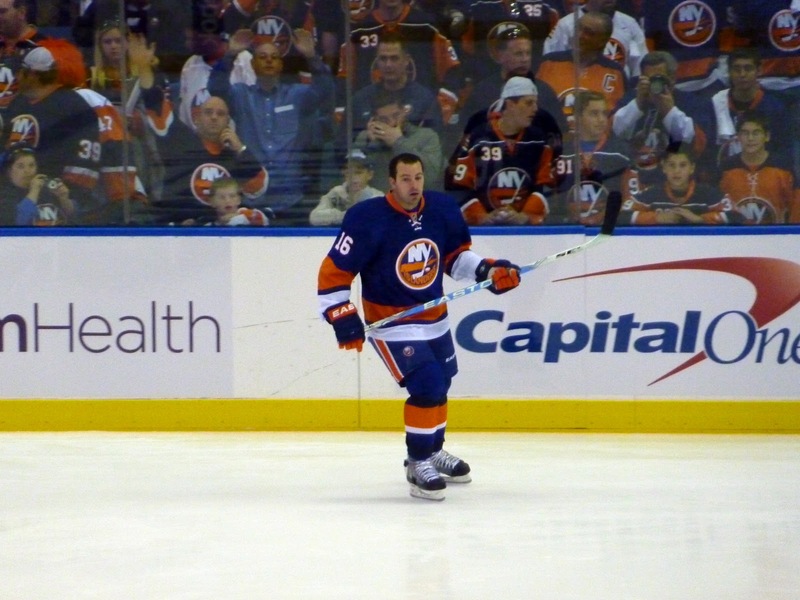 The Islanders immediately assigned Wishart to the Bridgeport Sound Tigers. It is unclear when he will come up. Currently on their long road trip, the Islanders have Dylan Reese up and have placed Radek Martinek on the IR for now. Perhaps we see Wishart when we come back from that trip. Wishart has only played five NHL games to date so far. Meanwhile, Tampa Bay did what they really needed to do which was improve the goaltending. It was no secret that that was the one are they were looking to upgrade along with their division rivals, the Washington Capitals. Washington has been scouting the Islanders frequently in the past few weeks, presumable looking at Roloson. The return for Roloson isn't the head scratcher here, but at a quick glance the timing does seem off. The Islanders are in the midst of a stretch where they have won six of their last eight games, most of that due to the play of Roloson and him getting NHL player of the week honors last week. In his final game as an Isle against one of the West's best teams in Detroit, Roloson stood tall again and made 38 saves in an OT win. Some are upset because of how good Roloson is and the team has been playing. That's what people mean when they say the timing is off. It is not good to show signs that you are giving up 36 games into an 82 game schedule, but that is the message the Islanders appear to be giving, not two weeks after Garth Snow and Charles Wang went on Gary Bettman's radio show and stated otherwise. Now, we don't know for sure - perhaps Wishart is a guy Snow targeted for a while, and perhaps this offer topped something Washington was offering for him. To get a real live NHL player back over picks for a 41 year old goalie is something to be happy about. Perhaps it is slightly unfair of people to think that these deals are all about the money, but it certainly appears that way. It's the only explanation people can come up with for these moves, and no, there is not going to be a blockbuster trade coming at this time for those of you going nuts over Twitter rumors. At any rate, I'm excited to see what Wishart can bring. I'm hoping he can continue to show us some of what he has been doing this year, which would really be great for us. On the other end, I'm having a very hard time finding Isles fans who don't want Tampa to go deep or all the way in the playoffs this season. That's how well liked Roli was here on the Island. Good luck in Tampa, Dwayne. NYI FYI RETURNS LIVE: Yes, you read that right. After about a year of people wondering and hoping if we would come back live we are finally doing so. We will be broadcasting today's show at 11 AM through UStream. You can watch us using this link. We will not have a phone line, but you will be able to interact with us during the show by sending in thoughts and questions through an AIM screen name that we will provide, as well as sending us your comments on Twitter (@NYIFYI). Naturally, we will still be making the podcast component of the show. We hope some of you are able to join us live at 11 AM, and please don't be a stranger. We have a lot to discuss, and it's the perfect opportunity to let your voices be heard.